The following obituary was taken from the Beckley Post Herald, dated Tuesday, October 12, 1937. Hinton - Oct. 11 - Mrs. Elizabeth Gwinn, 92 years old, grandmother of C. N. Gwinn, assisant superintendent of county schools, and Mrs. E. B. Fox, of this city, died at her home at Meadow Creek at 6:30 o'clock Monday morning. Funeral services will be held Tuesday afternoon at 2:30 o'clock at the residence, conducted by the Rev. J. F. Atkins, pastor of the First Christian church of this city, assisted by Rev. D. G. Richmond, of Meadow Creek. Burial will be made in the family cemetery near the home. Mrs. Gwinn was born at Meadow Creek in 1845, and spent her entire life there. Her husband, Lewis W. Gwinn, died 25 years ago. 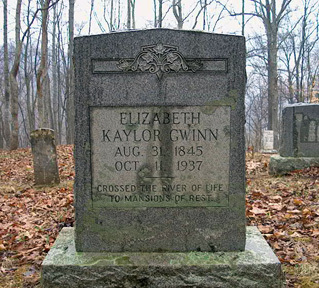 She is survived, in addition to her grandchildren, by four sons; M. N. Gwinn, Marshall Gwinn, E. G. Gwinn, M. E. Gwinn; and one daughter, Miss Mary Gwinn. All reside at home.